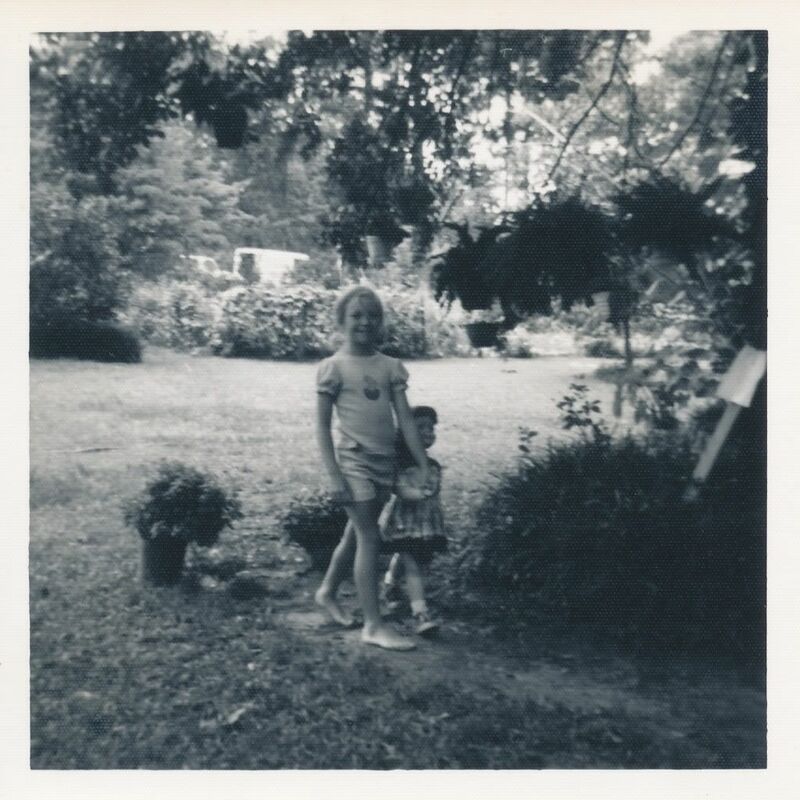 When my brother and sisters and I were little, we always played outside in our Tallahassee backyard, which was about an acre in size and elaborately landscaped by our parents. There were two vegetable gardens and a rose garden and plum trees and a bed with canna lilies and another bed with bulbs (hyacinths) and zinnias and marigolds. There were native azaleas and huge beds of Indica azaleas (Formosa, George Taber, and Mrs. G.G. Gerbing). Mom and Dad collected camellias and daylilies, and they grew ruffly orchids in pots; the orchids hung in the big oak trees along with the moss. We kids had so much fun in the yard. We added things to it—paths worn into place by our feet, and forts, little lean-tos under the trees. 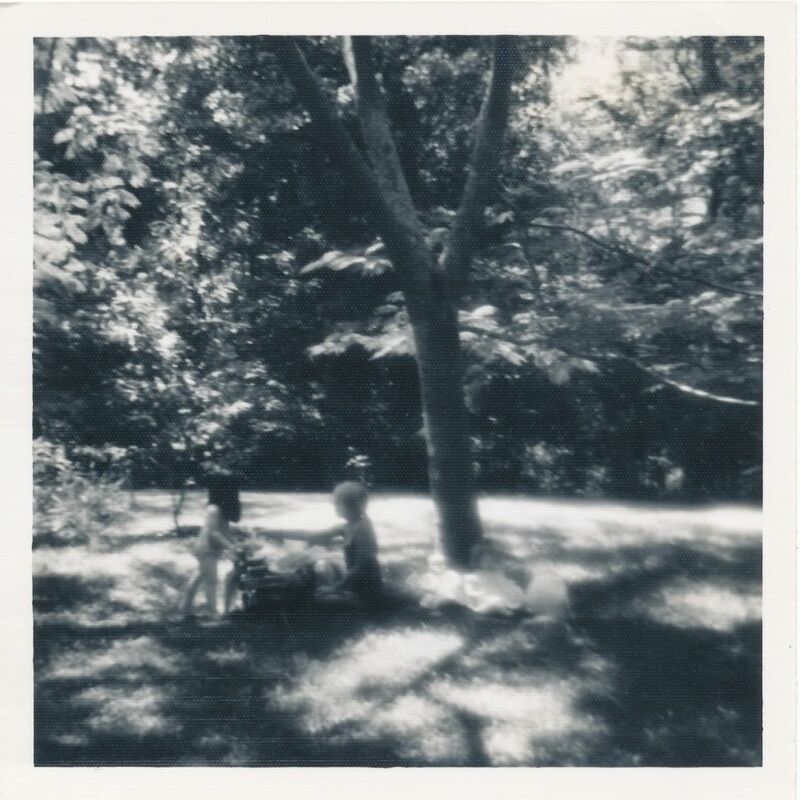 We had a trampoline and a swing set and a plastic pool, and when I was nine and 10 we always pretended that the backyard was a park—Bayvery Park. We made a ticket booth out of a cardboard box and sold carefully designed tickets to ourselves and our dolls and stuffed animals. Kris and Amy (our doll) strolling into Bayvery Park. You can see the park's sign leaning up against the tree. Normally, it wouldn't be leaning; it would be standing up straight. There was a snack stand in the park, staffed by my sister Kris. She sold Kool-Aid and whatever other snacks we could scrounge up. 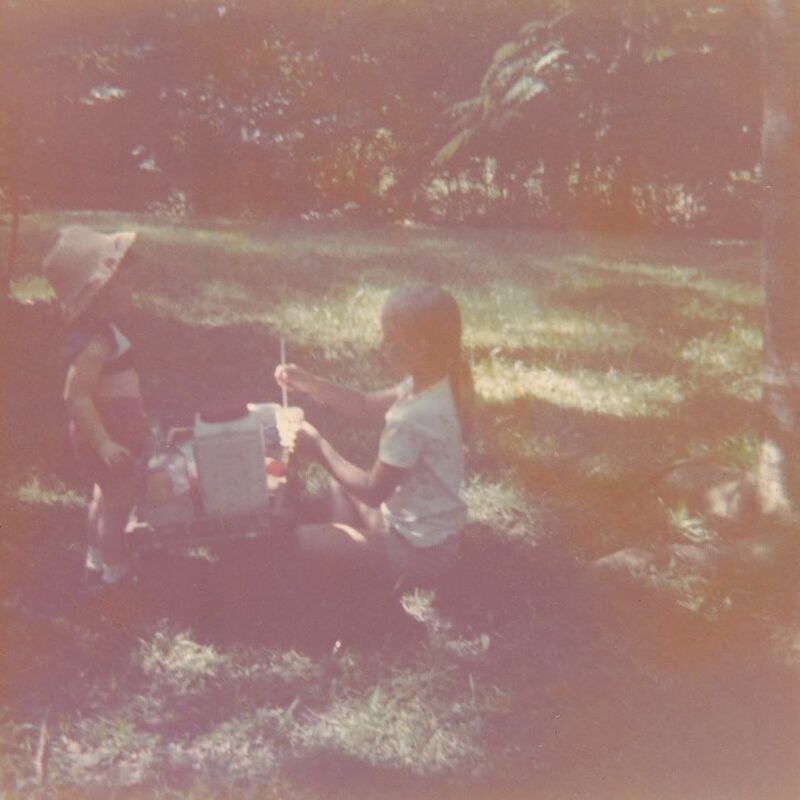 Snacks were very hard to come by at our house, but she sold what she could at her little stand under the mimosa tree. The mimosa was the centerpiece of the park, of our yard. I know now that mimosas are invasive and I would never have one, but back then we didn’t know it—and we loved our mimosa tree. It was a special mimosa, much bigger than most, grand and spready like an oak, and climbable. In May it was full of pink, soft blossoms, and we’d perch comfortably in the crown, surveying the yard through a pink haze. It was like wearing rose-colored glasses, to look down through the mimosa flowers. Kris manning the snack stand. Amy is her customer. I should mention that all the trees had names and personalities, and that we would spend a great deal of time standing under them, talking to them. We called the mimosa Grandma Pearl. She was the mother of Chudy, our best tree friend, a gray, kind water oak that stood by the trampoline. In our games there were elaborate storylines involving the trees. We all resided in the town of Lemonburst, a wonderfully fair-minded place where trees, cats, dolls, and people were all equal under the law. A big draw at Bayvery Park was the plastic pool, which we’d “chlorinate” with bleach so it would seem more like a real pool. We always floated petals in it, just to make it prettier. And we would post pool rules on a big sheet of computer paper “laminated” with cling wrap. Amy and Jennifer and Ginny at the pool. Note that Ginny is washing her foot in the "foot bath" so as not to get the pool dirty. What a nice summer memory from times gone by. Sounds like you had a fun childhood. 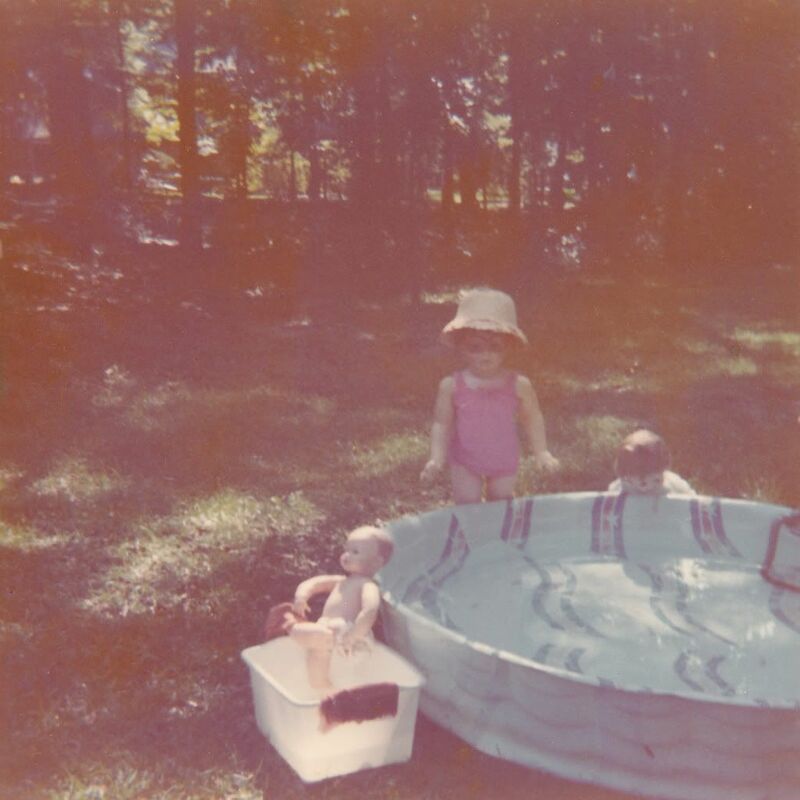 We used to have a plastic pool, too, and we loved playing in it...it was really a necessity to get a break from the heat. I love this post! I didn't rember Amy having such a variety of perfect park-going outfits. I love all of the pictures! Thanks, Susan. It was a great childhood. We had so much fun in that tiny pool. And we would rig a hose up with a spray nozzle and arrange it in this certain pear tree so it would spray on the trampoline. Then we would jump in the mist. It was so much fun! Kris, it was so sad looking at the pictures. I wish we had more, and so many times I wish I could go back to selling tickets at Bayvery Park! OMG- I wish I could, too. "Me? Oh, I work at the snack stand at Bayvery Park." Problem solved.